Review of Fullers Bengal Lancer | Beer Apprentice - Craft Beer News, Reviews, Interviews and Info. What’s up guys? For today’s craft beer review I’m going to be trying the Fullers Bengal Lancer made by Fuller Smith & Turner PLC Brewery located in London, England. We all know about Fullers, so let’s just get to the website, fullers.co.uk, and see what it has to say about this brew. 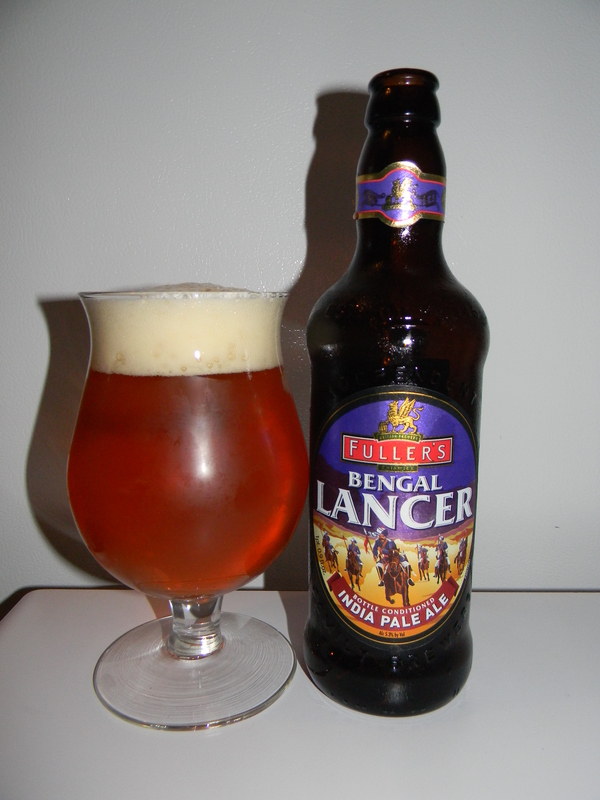 Bengal Lancer is an exciting, classic India Pale Ale from Fuller’s. Brewed to 5% ABV (5.3% in bottle), this ale has been inspired by the history and character of this traditional style of beer. Bengal Lancer has returned to pumps for an extended period between Autumn 2012 and Spring 2013. This beer came in a 16.9 oz. bottle and it had an ABV of 5.2% (according to the label on the bottle). It discharged a relatively clear orange color. Just a smidgen of chill haze was to be had. The crown was barley off white, somewhat foamy and soft. The size was good and the retention time was solid. The lacing wasn’t the greatest, yet it wasn’t all that bad either. Mostly average I guess. The nose releases some orange citrus with a solid backbone of caramel malt. A nice aroma of lightly toasted breads and biscuity scents contributed a roundness that I liked. I even thought that I detected a little bit of honey in there. All in all, not bad. The flavor brought forth a slightly sweet touch of orange citrus, which had a low to medium bittering profile. Again, some toasted breads and light caramel along with some clean grains and cracker type malts kept things calm and balanced. Overall, the flavor tended to be a bit simple, yet it was good and harmonious. Sometimes simple is a good thing. The mouthfeel was medium bodied. Quite smooth and slick with a semi-dry and crisp finish. The carbonation was of medium strength and an “ok” amount of flavor was left behind on the palate after each sip. Well, this beer was solid for sure. It’s definitely not a “hop bomb” like American IPA’s, but it maintained enough bite and punch to make for a suitable drink for those hop lovers. The drinkability was excellent and I don’t think that it would be any problem to put a few of these down during a session at any point throughout the year. I’d drink it again that’s for sure. I’d also suggest picking it up if you see it on the shelf somewhere. It’s been a while since I last had a beer from Fullers, but with the satisfaction that I received from the Begal Lancer I may have to revisit some of their other products.